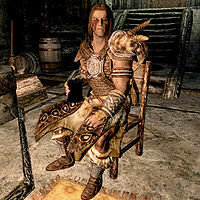 Vorstag is a Nord warrior living in Markarth at the Silver-Blood Inn. He can be hired as a follower for a fee of 500 septims. He is proficient in Archery as well as One-handed. He levels up consistently with you and proves to be a solid follower for mage or rogue players. After hiring Vorstag, he becomes a potential candidate for marriage. Vorstag wears a set of scaled horn armor with matching pairs of bracers and boots. He is equipped with an iron war axe and an iron shield. "I'm what you'd call of soldier of fortune. Make me an offer, and I just might fight at your side." "Can't be too careful these days, with the war and other dangers. For a fair price, I'll watch your back." "If you've got the gold to pay my fee, then my sword-arm is yours." "Some call me a mercenary, but I like to think of myself as a freelance adventurer for hire." And when bid goodbye, he may call, "Watch your back, friend. Better yet, pay me to do it for you." When hired, he will decide, "That's a fair price. My blade is yours." When asked to follow, he will simply announce, "I'm ready." And when told to wait, he will comply with, "I'll wait here. Just don't start any trouble without me." Finally, when told to leave, he will bid you goodbye, saying, "Farewell, then. If you need my services again, just come and look for me in the usual place." Vorstag will willingly carry your items, asking, "Sure, what have you got?" After being hired and subsequently fired, he will greet you with, "It's good to see you. If you need my help again, it's the same fee as always." or "Well met, friend. It's good to see you're still in one piece, with all the trouble you get into." Vorstag, like other hirelings, may offer his services for free, saying, "If you still need my blade, I'll join you. I want to make sure you get your money's worth." If you accept, he will confidently state, "Alright, then. Let's go"
Vorstag seems to greatly dislike mines and often makes comments regarding this whenever the player is in one; however, the Dwemer seem to fascinate him, and he constantly comments on various facets of the dwarves' ruins as you explore them. He is usually the first to battle and follows more closely than other followers or dead thralls. He seems to use bow or close combat equally and happily trades items. During The Forsworn Conspiracy, you may choose to ask him about Margret, to which he will gruffly affirm, "Aye. She's by the fire." or "I remember her. Her stance. The way she walked. A trained warrior, no doubt. She had a room here. Might talk to the innkeeper about it." The second line will only be heard if Margret was killed by Weylin. Although his default gear is governed by the Light Armor skill, Vorstag is actually more proficient in Heavy Armor. This issue has been addressed by version 2.0.4 of the Unofficial Skyrim Patch; Vorstag's class was changed to CombatBarbarian.